Computer Accounting Solutions software engineering. We can provide your company with a truly scalable solution to your MIS software needs. Read more about our software and services on the About section. Or you can Download any of our software solutions. 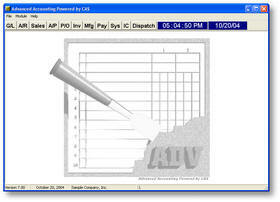 Advanced Accounting 7 Powered by CAS and TASPRO 7. now in the download section. Advanced Accounting DOCS online Click here!! We have extensive knowledge of all Microsoft products including windows 95/98 ME NT 2000 server. In our office we have over 30 years of experience in microcomputers and database applications. W have now added the Linux operating system as a supported file server. Through remote control systems we support all our customers. We can work for you anywhere in the world With this technology. why do you have to hire in house when we can do the job for a fraction of the cost by contracting our company to do your programming work . We also use and support SKYPE this is a free internet phone calling system you can reach us on our skype name of rickatcas to get more information and the free software click here www.skype.com With skype our phone travels with is where ever we go. Give us a call. or email us.